The National Hockey League has handed out its awards for the 2015-2016 NHL season, with the ceremony taking place in Las Vegas. Artemi Panarin became the first Chicago Blackhawk to win the Calder Trophy for top rookie player since Patrick Kane did so in 2008. Panarin won out over nominees Connor McDavid and Shayne Gostisbehere. The 24-year-old Russian had 77 points, including 30 goals and 47 assists. Kane picked up the Ted Lindsay Aware for most valuable player as voted on by other players. 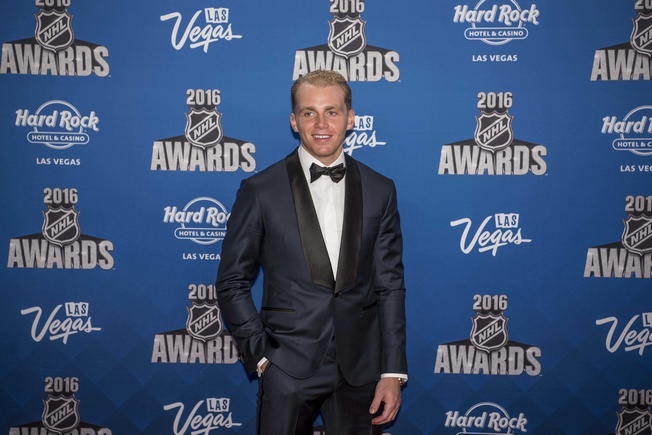 He became the first Blackhawk and the first American-born player to win the award, defeating nominees Jamie Benn and Braden Holtby. The 27-year-old for Buffalo led the league with 106 points, including 46 goals and 60 assists. Pittsburgh Penguins general manager Jim Rutherford picked up the NHL’s General Manager of the Year award, with his club winning the Stanley Cup. Rutherford made a number of integral moves to put the Penguins in position for the big win, including the addition of players like Phil Kessel and Nick Bonino. He also hired head coach Mike Sullivan, who turned the team around after an early slump. Jaromir Jagr won the Masterton Trophy for perseverance and dedication to hockey. The 44-year-old led his Florida Panthers to their best season in franchise history and he nailed 66 points, becoming the oldest player in NHL history to top 60 points. Drew Doughty won the Norris Trophy for best NHL defenceman. He became the second player in Los Angeles Kings history to win it, with Rob Blake picking up the victory in 1998. Doughty beat out Erik Karlsson and Brent Burns in the voting, while Kris Letang wasn’t far behind. Doughty had 51 points in 82 points, including 14 goals and 37 assists. Kings forward Anze Kopitar snagged the Selke Trophy for the best defensive forward in the NHL. He’s the first Kings forward to win the Selke, defeating Boston’s Patrice Bergeron and Anaheim’s Ryan Kesler in the voting. Jonathan Toews was also in the running. Kopitar also secured the Lady Byng for the player best combining sportsmanship and ability. Aleksander Barkov and Loui Eriksson were other nominees. Barry Trotz picked up the Jack Adams Award for best coach, with Lindy Ruff and Gerard Gallant as the other nominees. The win is Trotz’s first, coming after he led the Washington Capitals to a President’s Trophy. Capitals netminder Braden Holtby won the Vezina Trophy for best goaltender, receiving 26 first-place votes out of 30 general managers. He beat out Ben Bishop and Jonathan Quick for the win, while Chicago’s Corey Crawford also received a first-place vote. The 26-year-old posted a .922 save percentage and a 2.20 goals against average, with three shutouts. Finally, Kane secured the Hart Trophy as most valuable player in the NHL. He became the first American-born player to lead the league in scoring and the first Hart winner on the Blackhawks since Stan Mikita. Kane beat out Sidney Crosby and Jamie Benn for the win. Next 2016 NHL Entry Draft: How Did Canada’s Teams Do?